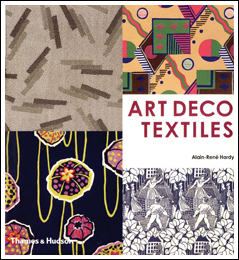 Radical innovations in Art Deco fashions and interior decorations demanded new designs for clothes and other textiles. This sumptuous new book invites you to discover the spectacular world of French Deco fabrics with examples from Delauney, Ruhlmann and dozens more. As the artist Raoul Dufy wrote, "Paintings have spilled from their frames and stained our dress and our walls." With over 310 full color illustrations from museums, manufacturer's archives and private collections, you get a taste of the vibrant fabrics of the time. (Originally published in France) 352 pages, TP, 9" X 10".